You experience a painful toothache that lasts for a few days, but eventually the pain subsides. Since there's no longer any pain, there's no longer anything wrong with the tooth, right? 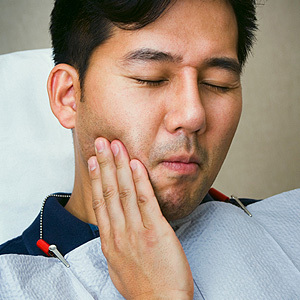 Maybe not — the toothache may be the result of a decay-induced infection that has developed deep in the pulp of the tooth. The infection inflames both the pulp tissue and the nerves bundled in it (a condition known as pulpitis). Because it occurs in an enclosed space, the pain is even more severe. Now it's possible for the inflammation to subside and the nerves to heal, which would explain the pain subsiding. But there is another, more likely scenario: the infected pulp tissue can no longer fight the infection and dies. The affected nerves die also, which is why you no longer feel any pain — the dead nerves are no longer transmitting a signal to the brain. The infection, however, is very much alive and continues to advance deeper into the surrounding tissues where it may eventually develop into a painful abscess. So, how can we determine which of these two scenarios you are actually experiencing? A visit to our office for testing is the surest way to find out. The most common test involves temperature sensation, usually with the application of ice to the affected tooth. If there's no sensation, then that's evidence the nerves in the tooth have died. If that's the case, it's important then to take steps to stop the infection's advance before it does even more damage. The most likely treatment is a root canal, a procedure that accesses the pulp from the top of the tooth, removes the dead tissue, and then cleans and prepares the root canals for filling. This procedure can usually be performed in our office, but more involved cases may require an endodontist, a specialist in root canals. In any case, if you experience a severe toothache, please have it examined. And remember — the absence of pain after a toothache doesn't necessarily mean the problem is gone.